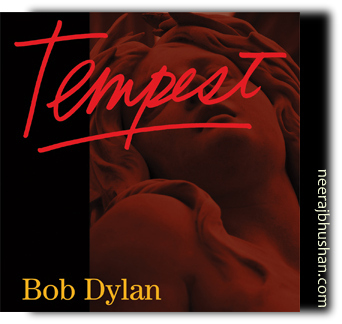 Bob Dylan’s new studio album, Tempest, will be released on September 11, 2012 featuring ten new and original Bob Dylan songs. Tempest marks the 50th anniversary of his 1962 Columbia Records debut album Bob Dylan. The new album, produced by Jack Frost, is the 35th studio release from Bob Dylan, and can be pre-ordered now on iTunes and Amazon. Bob Dylan’s four previous studio albums have been universally hailed as among the best of his storied career, achieving new levels of commercial success and critical acclaim for the artist. The Platinum-selling Time Out Of Mind from 1997 earned multiple Grammy Awards, including Album Of The Year, while “Love and Theft” continued Dylan’s Platinum streak and earned several Grammy nominations and a statue for Best Contemporary Folk album. Modern Times, released in 2006, became one of the artist’s most popular albums, selling more than 2.5 million copies worldwide and earning Dylan two more Grammys. Together Through Life became the artist’s first album to debut at #1 in both the U.S. and the UK, as well as in five other countries, on its way to surpassing sales of one million copies. Those four releases fell within a 12-year creative span that also included the recording of an Oscar- and Golden Globe-winning composition, “Things Have Changed,” from the film Wonder Boys, in 2001; a worldwide best-selling memoir, Chronicles Vol. 1, which spent 19 weeks on the New York Times Best Seller List, in 2004, and a Martin Scorsese-directed documentary, No Direction Home, in 2005. Bob Dylan also released his first collection of holiday standards, Christmas In The Heart, in 2009, with all of the artist’s royalties from that album being donated to hunger charities around the world. This year, Bob Dylan was the recipient of the Presidential Medal of Freedom, the highest civilian honour in the United States. He was awarded a special Pulitzer Prize in 2008 for “his profound impact on popular music and American culture, marked by lyrical compositions of extraordinary poetic power.” He was also the recipient of the French Commandeur des Arts et des Lettres in 1990, Sweden’s Polar Music Award in 2000 and several Doctorates including the University of St. Andrews and Princeton University as well as numerous other honours. thanks for this helpful post, I’ll keep a watch out for the release from the tambourine man! …and I always wonder WHY he hasn’t visited India – my country – yet !